Some readers might have noticed that I briefly published a post about selling Retail Holdings yesterday. One reader quickly noticed that there was a pretty big mistake in my sheet (note to self: maybe don’t update sheets and trade while on the train…) which does change the story a bit. 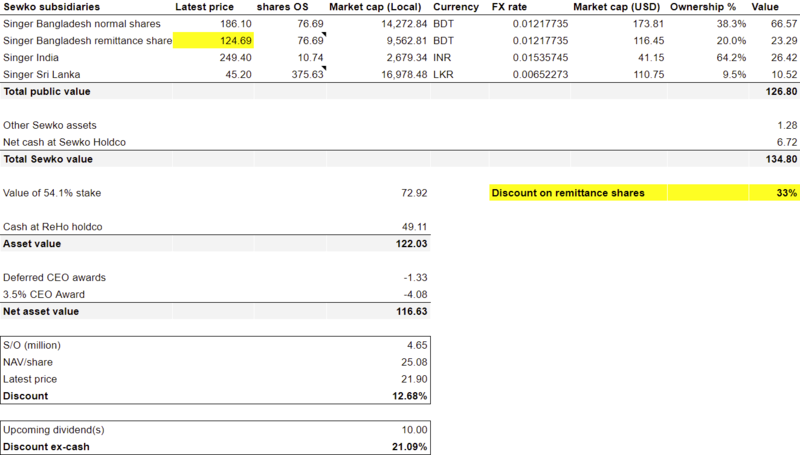 I thought that a discount of 33% on the non-remittance shares would mean that there was almost no upside left in Retail Holdings, while in fact the discount is still 21.1% (pro-forma for the $10 in dividends that will be paid in the coming months). It is tempting to rationalize your previous selling decision and find a new reason to support the move, but a mistake warrants a fresh evaluation. While the discount isn’t particularly big I think I’m happy to continue owning a (smallish) position. So I decided to correct my mistake of yesterday, and I rebought today. I still think that it was a disappointing development that the company sold their SVP notes for a nominal amount last month. They had been written down in the past to zero already, but with a face value of $32.7 million it provided a nice bit of optionality that is now definitively gone. This entry was posted in Portfolio and tagged RHDGF on October 4, 2017 by Alpha Vulture. Just wanted to confirm that there is a withholding tax of 30% on the dividend to be paid out? There should be no withholding tax. How did you come up with the discount of 33%? Sort of random number. I don’t think those shares are worthless and I don’t think they are worth the same as the normal shares. So 33% seemed like a decent starting point.